Opatija, often called the queen of the Adriatic, is one of Croatia's most famous destinations, boasting a tradition of welcoming visitors dating back more than 160 years. 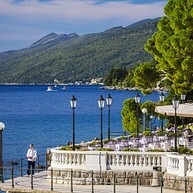 Located at the edge of the Mediterranean, on the slopes of Mount Učka gently descending towards the coast of Kvarner Bay, Opatija with its local climate, beautiful architecture, quality hotels and luxurious, well-tended parks and promenades, offers plenty of possibilities for a pleasant stay throughout the year. 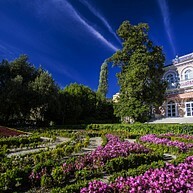 With the arrival of Iginio Scarpa, a patrician from Rijeka and building of his summer house Villa Angiolina in 1844, Opatija opened her doors to a whole line of guests and passengers. This is the building that certainly marked the beginning of the tourist epoch in the history of Opatija. Most probably built in 1420, as a colony of Benedictine refugees from the Friulian monastery of Saint Peter in Rožac (San Pietro di Rosazzo), the entire settlement will later be named after this abbey. 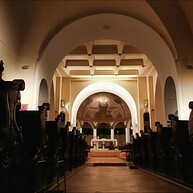 Today very little has been preserved of its original appearance. 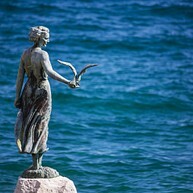 On the promontory in front of the one-time cemetery a girl of stone extend her arm to a gull. This, however, is a new sculpture, the work of a sculptor Car, and it was erected here in 1956 and turned into one of Opatija’s symbols. Opatija's Saint James Park is located in the centre of the town, in the protected historic part, next to the Church of Sveti Jakov (St. James) and the former monastery. Its location was the nucleus for the development of the town. The upper part is dominated by the neo-baroque fountain Helios and Selene, the work of the sculptor Hans Ratkausky from 1889. The building that the inhabitants and guests of Opatija today mostly know as a venue for various exhibitions, concerts and theatrical performances, was originally a pastry shop. It was built in 1900 for the Quarnero company of Vienna, and expanded in 1908 following the plan of the Opatija architect Sandor Neuhausler. The Swiss House, located in the Angiolina Park, is today one of the three buildings of the Croatian Museum of Tourism where exhibitions present the history of Opatija. The Croatian Walk of Fame is a symbolic tribute to all the people whose sporting, scientific, cultural or artistic endeavors have contributed significantly to the worldwide promotion of Croatia. Check who are the laureates! 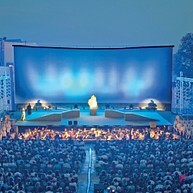 The Open Air Theatre is situated on the green "peninsula" of the well-known Opatija’s “Angiolina Park”, right by the sea. This unique location and its ambiance created by the combination of stone walls and greenery make it the most spectacular and the most beautiful venue of this kind in the Mediterranean.